Assessing a site’s remediation potential is a key step in selecting the most effective remedy and efficiently using often limited funds. The outcome of a remediation potential assessment can help to set site objectives and determine if adaptive site management is recommended. Once a CSM is in place, a site’s potential for remediation can be evaluated. The remediation potential assessment uses a weight-of-evidence approach to determine if a site is likely to achieve remedial objectives within a reasonable time frame (which can be estimated), or if site challenges warrant use of an adaptive site management approach. This assessment relies on available site data, analogous site information, predictive assessments, or a combination of these to support the evaluation. The assessment does not produce a default decision, but rather aligns expectations with actual remediation potential for the site. Remediation potential can be evaluated for an entire site or for discrete site segments that represent parts of the site with different characteristics (such as source versus plume, or different water bearing units). Assessments of remediation potential may be conducted at different points throughout all phases of the cleanup including remedy selection, remedial design, remedy implementation, monitoring and performance evaluation. The amount of characterization data available to support a remediation potential assessment depends on the remedial phase of the project. Each phase of a cleanup can supply additional data to support and further develop the CSM. If site characterization and feasibility study data are adequate (meaning the CSM is developed to at least the Baseline CSM Stage), then remediation potential can be assessed prior to a remedy decision. In some cases, such an early assessment could be supported by pilot test results, data from analogous sites, or predictive modeling. A preremedy remediation potential assessment typically requires more detailed supporting data on the nature and extent of contamination than an assessment at a later phase in the project. Evaluation criteria for preremedy remediation potential assessments may also be considered. In other cases, an assessment (or reassessment) of remediation potential might come later in the remedy process and can include remedy performance data. Additional metrics are appropriate for later phases of the remediation process (postremedy implementation). Metrics to assess remedy performance and the need for optimization or other remedy adjustments for a site are also addressed as part of long-term management. The remediation potential assessment is applied for screening purposes and as a tool during regulatory decision making. This assessment is designed to be used at a wide range of sites under any regulatory program and at different points in the remediation process and site life cycle. While the assessment focuses on groundwater remedial objectives, it can be adapted to the remediation of other media as well. The process for remediation potential assessment can help promote an effective and transparent interaction among the site owners, regulators, and stakeholders during regulatory decision making. Engaging in this process can align stakeholders’ understanding of the site conditions and their expectations with the likelihood of achieving site objectives (for example, restoration to numeric criteria such as MCLs) in a reasonable time frame. Stakeholders are sometimes concerned about applying an assessment of remediation potential prior to implementing remedial options because of the subjective nature of such an evaluation. At some sites, it may be useful to segment the site or contaminant plume, rather than consider the site or plume as a whole. Prior to a remedy decision (such as Interim Measures, Interim Remedial Action, Record of Decision (ROD), Corrective Action Decision, RCRA permit, or order), the whole site or plume may be divided into discrete subsets or segments that are candidates for different remediation management strategies. Under RCRA, sites may be administratively divided into solid waste management units (SWMUs); under CERCLA, sites are divided into operable units (OUs). The whole site can be considered in the assessment of remediation potential; however, for some sites that are not already divided into operable units, it is also reasonable to divide the site into segments for assessment purposes. If segments are used, then the segments will represent portions of the site that can be managed separately with respect to site remediation, since it is not useful to define many small areas as segments. For instance, it may be useful to manage a source segment and a plume segment separately or to consider a large distal plume separately from a smaller, more concentrated core of the plume. This division could be important if there is a small shallow source that is easy to treat, but also a large dilute plume that may be difficult to treat. In an example given in USEPA guidance (1993), if an unrestorable source area is contained, restoration of the dilute plume beyond the isolated source area may still be feasible. If a large, deep source and a large dilute plume are both present and difficult to remediate, then it is likely sufficient to use the remediation potential assessment to evaluate the whole site rather than applying it to separate site segments. The case study on the Koppers Oroville wood treatment site (see summary also) provides an example of using different remedial approaches for the source zone, on-site plume, and off-site plume. Remedial actions applied to a segment should be consistent with the expected final remedy for the site. For simplicity, references to a “site” in this guidance also include an entire plume or a site segment. If an ongoing remedy is not working as anticipated, then the site might benefit from division into site segments and a preremedy remediation potential assessment for the segments to evaluate alternative remedies. Table 4 lists questions addressing different assessment evaluation criteria that can affect the likelihood of achieving site objectives, particularly groundwater remedial objectives, within a reasonable time frame. These questions are related to some of the site challenges and are based on the ITRC RMCS team members’ professional experience with practical considerations for evaluating remediation potential early in the remediation process. The questions also closely follow the factors affecting groundwater remediation listed in USEPA guidance (1993) and New Jersey guidance (2013). The assessment can draw on available site data, analogous site information, or predictive assessments to answer these questions. The assessment questions in Table 4 are appropriate prior to remedy selection and implementation, for instance, during the Feasibility Study (FS)/Corrective Measures Study (CMS) or Remedial Investigation (RI)/RCRA Facility Investigation (RFI) phases or analogous phases in state cleanup programs. The assessment metrics in this remediation potential assessment are not necessarily of equal significance, since a single factor or pair of factors can make remediation difficult. Site owners, regulators, and stakeholders can incorporate or substitute questions pertinent to their site. An oversight agency could elect to use this information, with consultation from interested parties, to support decisions within an adaptive site management approach. Documenting the basis for choosing answers allows greater transparency and facilitates future reviews of the process. This documentation is especially important at complex sites where the project life cycle may last decades and knowledgeable stakeholders may be replaced with newer project participants. As with any site assessment, sufficient and appropriate site characterization is critical. 1. How difficult is it to work at the surface of the site? How much of the potential site treatment zone is accessible (such as for drilling or excavating)? Are structures, active process units, sensitive environments, or other restrictions present? 2. How difficult is it to drill at the site? Is drilling difficult, slow, and resource-intensive in the site? For example, in uncomplicated conditions where contamination is shallow, direct push technologies can be used to install multiple wells. 3. What is the scale of the source zone or plume? What is the extent of source and plume contamination? Remediation potential may be significantly less if source volume or plume area is extensive. 4. What contaminant concentration reduction is needed? What is the reduction needed throughout the site to achieve interim objectives? If several orders of magnitude reduction in contaminant concentration is required to reach groundwater remediation goals, then a long remedial time frame is more likely. 5. Do the key site constituents readily attenuate relative to the travel time to receptors? What is the estimated rate of biotic and abiotic attenuation in the site? If contaminants and geochemical environment are amenable to natural attenuation processes, a site is likely to be remediated in a reasonable time frame. 6. Does difficult-to-remove mass exist at the site? How much contaminant mass is nonaqueous phase liquid (NAPL) or is present in the low hydraulic conductivity (low-K) zones in the site? If significant contaminant mass is in low-K zones (or in fractured or karst bedrock), the plume will likely persist for a long time without remediation of the mass. If contaminants are present as NAPL, contamination may also persist. 7. What is the predicted remediation performance for available remedial technologies? Are proven applicable technologies available to address the contamination at the site? Do direct observations at similar sites indicate significant uncertainty and long remedial time frames? 8. What is the predicted time frame for achieving interim or site objectives? Given available remediation approaches, how long would remediation of the site take? Calculation tools can be used to predict if any approach or combination of approaches could achieve interim objectives for the site in a reasonable time frame. Other site-specific concerns can be added to the list of questions as needed. The questions can also be adapted to focus on media other than groundwater. USEPA’s nine CERCLA criteria (40 CFR 300.430(e)(9)) are not explicitly included in the Table 4 questions, but are related to many of the questions, particularly those focusing on effectiveness, implementability, and cost. The nine criteria were developed to evaluate remedial alternatives (USEPA 1997b) and are statutory requirements for CERCLA. Cost is always an important consideration, but is not included as an explicit criterion since many regulatory programs do not rely on cost directly. Cost, however, is an indirect part of many of the questions, such as Questions 1, 2, 3, 7, and 8. For some sites, the RI or RFI supplies sufficient data to answer the questions in Table 4. In some cases, the remediation potential assessment in Table 4 may identify additional studies needed to adequately answer the questions. Additional characterization and CSM updates may be conducted at any time during the process outlined in Figure 1. Are there known technologies that could be applied at the site? Has site been adequately characterized? What is the expected end use of the site? 3.3.1 Question 1. How difficult is it to work at the surface of the site? Sites with poor access (physical or legal barriers to access) are more difficult to remediate than sites with unlimited access. Other constraints include logistics and harsh environments. To remediate a site, amendments or energy are delivered to the entire treatment zone. While there are ways to manage difficult access, such as horizontal wells, in almost all cases the presence of buildings, infrastructure, and topographic features make it more challenging to apply remediation technologies. Administrative factors such as property rights and sensitive environment designations can also complicate access. The greater the percentage of the site that is inaccessible to remedial activities, the greater the likelihood that remediation potential will be affected. 3.3.2 Question 2. How difficult is it to drill at the site? Because most remediation efforts rely on drilling techniques, key assessment considerations include the available drilling methods, the site lithology, required spacing of remediation devices (such as injection wells) for implementing a remedy, and the depth of contamination. The USEPA’s TI guidance (1993) notes that remediation difficulty increases with contaminant depth. Examples of uncomplicated conditions are sites where contamination is shallow, allowing the use of direct push rigs to install multiple injection wells. Examples of conditions that make drilling difficult and expensive are fractured rock, heaving sands, deep contamination, and requirements for tight spacing of injection wells to achieve adequate treatment. This question can also be applied at sites where excavation, rather than drilling, is part of the remedy. 3.3.3 Question 3. What is the scale of the source zone or plume? Volume of source zone. A DOD research study (McGuire, McDade, and Newell 2006) conducted at 80 full-scale treatment sites examined the scale of source zone volumes. This study found that 25% of active in situ remediation projects at chlorinated solvent sites (such as chemical oxidation, thermal treatment, chemical reduction, and bioremediation) treated source zone volumes less than 2,000 cubic yards in size, while approximately 50% of active in situ remediation projects addressed source zone volumes greater than 2,000 and less than 25,000 cubic yards. Only 25% of these projects treated more than 25,000 cubic yards. These metrics serve as guidance in interpreting the relative scale of a given sites and are provided as context for the typical size of sites where active in situ remediation technologies have been applied. These size ranges, however, do not preclude the successful remediation of larger sites using these technologies or reflect any inherent limitations of these technologies at larger scale. Plume extent. The extent of a plume can affect the time frame for groundwater remediation, especially when combined with other factors such as depth of contamination, presence of NAPL, high contaminant concentrations, or a complex hydrogeological environment. According to one study (Wiedemeier et al. 1999, Figure 2.2), the average area of a gasoline station site plume was approximately 32,000 square feet; the average chlorinated ethene plume was about 500,000 square feet; the average for nonethene chlorinated plumes (mostly chlorinated ethane plumes) was about 200,000 square feet; and the average for non-gas-station hydrocarbon plumes was about 100,000 square feet. All other criteria being equal, plumes larger than the average plume size for a particular class of plume are likely to have lower potential for rapid groundwater remediation than smaller than average plumes. 3.3.4 Question 4. What contaminant concentration reduction is needed? The groundwater monitoring well with the maximum concentration at a site is typically the key metric for site closure. Because concentration reductions are key, remediation based on orders of magnitude (OOM) to reach site groundwater goals can be a useful concept. To answer this question, a study compiled the OOM reductions of 216 different in situ remediation projects at chlorinated solvent sites. The study found that 75% of the in situ remediation projects had at least a 0.5 OOM (68%) reduction in parent concentration and 25% had more than 2 OOMs (99%) reduction (McGuire, McDade, and Newell 2006). Based on the experience of some team members, this type of performance can be expected at LNAPL sites as well as DNAPL sites. Current recommendations for using OOMs to evaluate concentration reductions are included in ITRC’s Integrated DNAPL Site Strategy guidance (ITRC 2011b). Based on these data, a threshold of 2 OOM reduction or more can be classified as a “Low Likelihood of Achieving Remediation Objectives.” This recommendation may change over time as data are updated. A site evaluation should always include the latest available guidance when estimating the possible magnitude of contaminant reduction. If multiple constituents are found at the site with different cleanup levels, then all the candidate contaminants for the greatest OOM required to reach remedial goals should be evaluated and the maximum result used to answer Question 4. Also, note that some difficult-to-remediate sites do not necessarily require a large reduction in contaminant concentrations. 3.3.5 Question 5. Do the key site constituents readily attenuate relative to the travel time to receptors? Sites with high rates of natural attenuation for the major site contaminants tend to reach site objectives more quickly than sites with lower attenuation rates. Sites where the contaminant class and the geochemical environment are amenable to rapid, ubiquitous natural attenuation processes are likely to be remediated in a reasonable time frame. Examples include benzene, toluene, ethylbenzene, and xylene (BTEX) compounds, because they can degrade in either aerobic or anaerobic zones (note that attenuation of TPH-related metabolites currently is an active area of research). Although metal and radionuclide contaminants remain in place with any natural attenuation process (such as precipitation, adsorption, or radiological decay), MNA can provide an effective site remedy through the stabilization and sequestration of the contaminant of concern. A natural geochemical environment that is not conducive to MNA processes will likely lengthen remediation time frames. For more information about natural attenuation, see the textbook by Wiedemeier et al. (1999); a “Frequently Asked Questions” report about more recent MNA developments (Adamson and Newell 2014) and a free online course focusing on MNA (Alvarez, Newell, and Adamson 2016). These two references divide the types of chlorinated solvent plumes into 13 different combinations of hydrogeology and geochemical environments, as well as six different scenarios of plumes of metals and radioactive compounds. 3.3.6 Question 6. Does difficult-to-remove mass exist at the site? This question addresses residual NAPL or the presence of contaminants that have diffused over time into low permeability zones, which are referred to as “low-K” zones by the Strategic Environmental Research and Development Program (SERDP) State-of-the-Science report (Sale et al. 2016). These contaminants then back-diffuse when the transmissive zone goes into a lower-concentration regime (such as after remediation, or after the source has weathered for a long time). If contaminant mass is contained in low-permeability media then it may be difficult to remove by most in situ remediation techniques such as chemical oxidation, bioremediation, and thermal treatment (Sale and Newell 2011, NRC 2013, Sale et al. 2016, ITRC 2011b). This contaminant mass may also serve as a long-term source of contaminants to groundwater. To answer this question, estimates of relative mass distribution between transmissive zones (sands and gravels) versus zones of low permeability can be considered. High-resolution site characterization (HRSC) can directly assess the distribution and scale of contaminants in complex heterogeneous subsurface lithologies. For further information on specific HRSC sampling technologies and 3D visualization subsurface software, see Integrated DNAPL Site Characterization and Tools Selection (ITRC 2015b). Another approach that can support high-resolution sampling or support planning-level evaluations of mass distribution is to use matrix diffusion models such as the Environmental Security Technology Certification Program (ESTCP) Matrix Diffusion Toolkit (Farhat et al. 2012) or other calculations. Supporting site data may be speculative early in a remedial project, but additional characterization data can refine the understanding of contaminant mass over time. Typically, complex heterogeneous geology results in contaminant mass that is difficult to remove. If more than 20% of the contaminant mass is in low-K zones (or in fractured or karst bedrock), the plume will likely persist for a long time. Key resource documents are based on research and experiences from chlorinated solvent sites (see Sale et al. 2008, Sale et al. 2014, Sale and Newell 2011). Research is also available on the effects of matrix diffusion at a methyl tertiary butyl ether (MTBE) site (Rasa et al. 2011). Additionally, numerous articles have addressed matrix diffusion as a process affecting metals transport at fractured rock sites. USEPA’s TI guidance (1993) categorizes interbedded stratigraphy, fractured media, and karst as having increased difficulty in remediation. While matrix diffusion has recently emerged as a key remediation constraint, other more familiar types of difficult-to-remove mass, such as residual NAPL, would also be relevant for this question (ITRC 2011b). 3.3.7 Question 7. What is the predicted remediation performance for available remedial technologies? This question is related to Question 5, but compares the question of “how much concentration reduction is needed?” with “how much concentration reduction is possible, given the known performance of the remedial technology?” The answer to this question depends on the level of confidence that proven technologies can achieve interim objectives and metrics and site objectives in a reasonable time frame. The strongest line of evidence supporting predictions of remedy performance is actual performance data from active remediation efforts at the site, followed by pilot testing at the site, results at similar sites, and then multiple-site remedy performance data reported in the scientific literature (see ITRC 2011b, Stroo et al. 2012, McGuire, McDade, and Newell 2006). A feasibility study can also be used to assess this evaluation criterion. Some of these lines of evidence may not be available, depending on where in the remediation process the assessment occurs. In some cases, poor remedy performance reveals that the contaminant source has not been adequately addressed. Adequate characterization of the site is necessary to reliably answer this question. 3.3.8 Question 8. What is the predicted time frame for achieving interim and site objectives? To answer this question, an engineering analysis (see Table 5) can be used to estimate the length of time for existing or proposed remediation projects to restore the site or to achieve interim objectives. Note that the hypothetical remediation projects (or continued operation of an ongoing project) should represent the current capabilities of the technology. An ongoing application of a remediation technology that has not been optimized would not be an appropriate basis on which to answer this question. A remediation time frame analysis can be performed several ways, including estimating postremediation concentrations and then using degradation rates to determine the time required to reach the groundwater concentration goals. Estimating time frames by applying a groundwater model can provide another line of evidence (see Table 5). Estimates should ensure that site complexities do not exceed a groundwater model’s capabilities and limitations. Several resources are available to help estimate remediation time frames. See Frequently Asked Question (FAQ) 16 in the Adamson and Newell study (2014) for an overview of methods, as well as research by Wilson (2011) or Chapelle (2003) for more detailed information. Input Required to Simulate Active Remediation? Methods for calculating key performance indicators range from simple arithmetic to highly sophisticated transport models incorporating chemical, physicochemical, and biological reaction rates. Using a specific method should be justified by the conditions to which it is being applied and supported by the appropriate quantity and quality of data. Subsurface contaminant transport models incorporate several theoretical assumptions about certain natural processes governing the transport and fate of contaminants. These assumptions may not apply at a given site, however, and these theories are often simplified when applied to practical problems. A maximum remedial time frame for achieving interim objectives is approximately 20 years. This estimate is based in part on the ITRC finding that 20 years or less is a “credible period of time” in which to predict remedy progress and success (ITRC 2011b). ITRC establishes this period as the limit for “functional objectives,” which are referred to as “interim objectives and metrics” throughout this guidance. Determining a reasonable time frame for achieving final site objectives at complex sites is a site-specific decision agreed upon by site owners, regulators, and stakeholders and may exceed many decades. While not applied at all sites, this value is a useful metric that should be evaluated to avoid open-ended remediation commitments. If multiple approaches can remediate the site within the time estimated for achieving interim objectives, then remedy completion within a reasonable time frame is likely. On the other hand, if no approaches are expected to meet the interim objectives, then for remedy potential assessment purposes, the likelihood of meeting those groundwater objectives in 20 years is low. A remedial time frame that is already established in a decision document can also be evaluated against a time frame analysis. Remediation potential can often be better assessed by initially examining the component issues that comprise the whole project. Considering these individual issues can lead to a clearer definition of the underlying concerns and thus a more rational and objective overall conclusion. The criteria for evaluating remediation potential assessment presented in Table 4 represent typical component issues that may affect attaining interim or site objectives at complex sites. Evidence for those issues at a site can be evaluated to determine the potential to achieve interim or site objectives in a reasonable time frame. This assessment process allows the effects of the individual criteria to be considered in context with all other criteria. For example, assessing the effects of factors such as the extent, depth, and concentration of a plume at a chlorinated solvent site in complex hydrogeology—as viewed together—may produce different results than assessing the individual factors. This process can be iterative, with refinement based on increased site knowledge and data, much like updating a CSM. The evaluation criteria questions can be organized into a matrix and then individually answered as high, moderate, or low likelihood for achieving remediation objectives. Table 6 presents a matrix that can be used as a remediation potential assessment tool based on the evaluation criteria questions in Table 4. Table 6. Remediation potential assessment tool: Can groundwater remediation objectives for a site be achieved in a reasonable time frame? The effect of the evaluation criteria on remediation potential is not likely to be equal. Sometimes, the likelihood of achieving remediation objectives may be high for most criteria, but a lower likelihood criteria may have fatal flaws that preclude achieving the objectives. While assessing the answers to the evaluation criteria questions, the site owners, regulators, and stakeholders may choose to give more weight to some questions than others or may substitute questions more pertinent to their site. The Remediation Potential Assessment Tool matrix in Table 6 is based on the assessment questions in Table 4. Neither the evaluation criteria nor the remediation potential matrix are derived from CERCLA regulations or guidance. Objectives are attainable. If the remediation potential assessment determines that the remediation potential is high, then remedy components that involve treatment technologies at the site should achieve interim and site objectives in a reasonable time frame. Objectives are not attainable. If the remediation potential assessment determines that the remediation potential is low, then remedy components at the site will not likely achieve interim and site objectives in a reasonable time frame. In this case, the long-term adaptive site management approaches should be considered. Various options are available within adaptive site management, including more active remediation, active containment, passive remediation, passive containment, active and passive mitigation measures, and management elements such as ICs and ARAR waivers. These options may be considered after reassessing the evaluation criteria and optimizing the remediation potential assessment. No clear outcome can be predicted; more study is needed. If the remediation potential assessment does not clearly determine a high or low remediation potential, either because the “moderate likelihood” category dominates the assessment or because the weight of evidence is balanced among the categories, then the assessment evaluation criteria should be reevaluated. This process may reveal inherent biases. With this outcome, all options, including remedy optimization, should be further evaluated. Table 7 includes an example of remediation potential rankings resulting in a high remediation potential for the following hypothetical site:The site has good access. The site has shallow contamination accessible by direct push. The source is moderate sized (about 10,000 cubic yards). Three orders of magnitude reduction in contaminant concentrations is required to reach cleanup goals. Contaminants consist of MTBE, BTEX, and TPH compounds which are readily attenuated. Significant residual LNAPL is present at site in the unsaturated zone, with some compounds found in low permeability zones. Experience at the site has shown that existing remediation technologies can achieve three orders of magnitude concentration reduction. REMFuel remediation timeframe model based on data in Questions 4 and 7 indicates 25 years would be required to remove the contamination left behind after remediation. Various remediation potential matrices can be used during remedy selection phases. These matrices can be valuable tools to effectively summarize the rationale for the outcome and highlight areas of agreement among the site owners, regulators, and stakeholders. This process helps to inform the remedy selection process and determine if an adaptive management process is appropriate. Value engineering (VE) has become a widely used tool for optimizing remedy selection or elements of a remedial design prior to its completion. A VE evaluation can be performed at any time during a remediation project’s life cycle, depending on the circumstances, needs, and costs involved. It is a formal, structured method for selecting the most cost-effective and efficient remedial solutions for a site. VE uses systematic and creative methods to reduce costs without sacrificing the reliability, efficiency, or original objectives of the project. A VE study differs from a traditional design/construction review in that it employs an independent, multidisciplinary team and group brainstorming techniques to recommend alternative concepts and approaches that achieve the overall project and design objectives, as opposed to simply concentrating on the technical aspects of a detailed design/construction project. A VE study differs from a traditional cost/benefit study in that the VE study seeks to improve a process, while a cost/benefit study compares alternatives. The overall goals of a VE study are to reduce capital investment and life cycle costs and improve long-term functionality of the design. The Office of Federal Procurement Policy Act (U.S. Code 432, updated by 41 U.S. Code 1711, Jan 2011) requires executive agencies to establish VE procedures. The Office of Management and Budget Circular A-131 requires federal agencies to apply VE procedures to all projects with estimated costs of $2 million or more. USEPA’s remedial project managers assure that VE screenings or studies are conducted on fund-financed remedial designs (USEPA 2006b). The U.S. Army Corps of Engineers (USACE) has applied VE methodology to 770 projects through September 2015 and has had a return on investment of over $38 to every $1 spent. The average net savings and cost avoidance for USACE projects over the previous five fiscal years was $378,036,000 per year. The VE study methodology guides the team in the development of project functionality and performance evaluation criteria (termed “performance attributes”). The methodology also helps to identify high cost areas, risk factors in the design/construction, and potential schedule bottlenecks or conflicts. The VE strategy is based on factors that include improved performance, likelihood of implementation, least community impact, cost savings, or any combination of a project’s performance attributes. See the Rocky Flats full case study for more details. The results of a VE study are presented as individual alternatives to the baseline concept. Each alternative usually consists of a summary of the baseline concept, a description of the suggested change, a listing of its advantages and disadvantages, a cost comparison, change in performance and value, discussion of schedule and risk impacts (if applicable), and a narrative comparing the baseline design with the alternative. As part of the evaluation process, defining performance attributes are identified, which are aspects of a project’s scope that may have a range of values. Those values represent the relationship between performance and cost and can be compared from alternative to alternative. Determining whether an existing remedy can achieve remediation objectives requires a different set of assessment questions than those presented in Table 6. The questions in Table 8 are adapted from USEPA’s Groundwater Roadmap (2011c) and can apply to both active remediation and MNA remedies at groundwater sites. Applying this assessment process can allow site owners, technical experts, regulators and private stakeholders to work together to determine if an existing remedy can achieve its objectives. 1. Is the monitoring program sufficient in quality and detail to evaluate remedy performance? 2. Has the existing remedy been effectively operated and maintained? 3. Are aquifer conditions or contaminant sources adequately characterized? Have they changed? 4. Are concentrations reductions occurring at the rate anticipated? 5. Are groundwater concentrations asymptotic or increasing? 6. Is plume capture sufficient (or uncertain)? 7. Does the selected remedy adequately address contaminants and/or hydrogeologic conditions? 8. Can interim and/or site objectives (and contaminant-specific cleanup levels) be met with other technologies within a reasonable time frame? Evaluation criteria 1 through 7 concern the adequacy of the selected remedy in meeting the established remedial objectives. At CERCLA sites, if it is determined that the current remedy is inadequate due to design, operation, or technology shortcomings, then USEPA may require that the remedy be “enhanced, augmented, or replaced” (USEPA 1993). Question 8 pertains to the potential of unproven technologies to achieve interim or site objectives in a reasonable time frame, much like the preremedy evaluation criteria in Table 4. 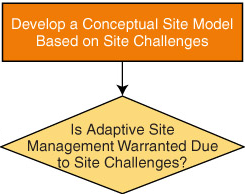 After concluding that reaching interim objectives is unlikely and that other technologies cannot achieve interim objectives in a reasonable time frame, regulators (together with site owners and stakeholders) may choose to consider options within the adaptive site management approach. Further information about predicting and evaluating remedy performance is presented in the discussion of long-term management.